I started digging garlic this week. Most of it is out of the ground now, curing in the garage. The last bit that is left will be dug today or tomorrow; as soon as I can find a place for it to cure, because this year I have a lot of garlic. A whole lot of garlic. It is good that I have a lot of garlic. I have wanted to save my own garlic for seed for sometime now. Last year, I bit the bullet and bought a lot of seed garlic with this in mind. I bought four varieties from Uprising Seeds: Inchellium Red (a softneck Ark of Taste Heirloom variety, found on the Colville Indian Reservation in Inchellium, Washington), Lorz Italian (another softneck Ark of Taste Heirloom variety, brought by the Lorz family from Italy to Eastern Washington), Chesnok Red (a hardneck from Shevlisi in the Republic of Georgia) and Killarney (a hardneck, possibly selected from Spanish Roja). I bought quantities based on what I had purchased in the past from other companies, but ended up with much more than I needed. The garlic I received from Uprising was bigger and more beautiful than anything I had bought before. I couldn’t let it all go, so I planted an extra bed of garlic, I gave some away, and we ate what was left all winter and still didn’t finish it off. With that beautiful seed, I have grown some beautiful garlic. 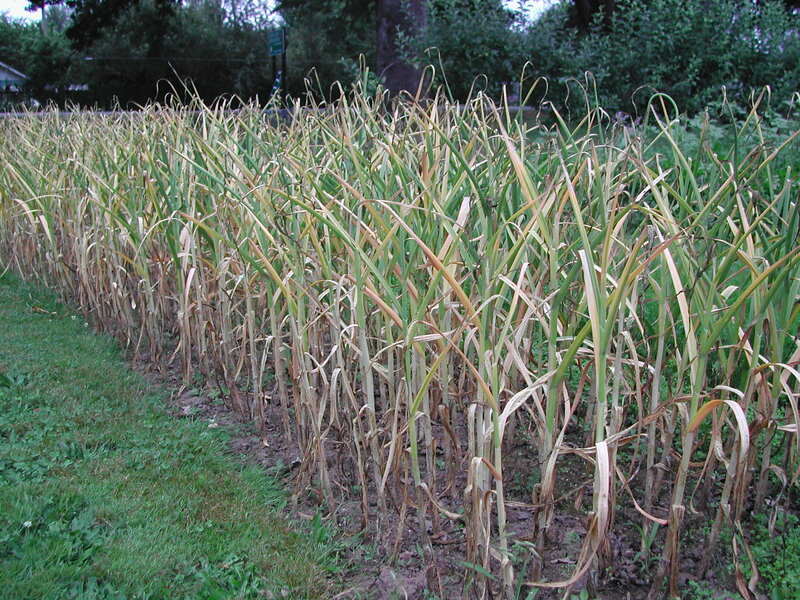 I will save the best to seed next year’s garlic crop. Unfortunately, there was one downfall: I put off digging the garlic just a little bit longer than I should have. Two of the varieties are hardneck types; they are the ones that make garlic scapes (the flower stalk and blossom). I had so many beautiful scapes this year, I put off harvesting the garlic so I could keep harvesting scapes. We also had a little rain just about the time to harvest, so I put off digging because of that, too. 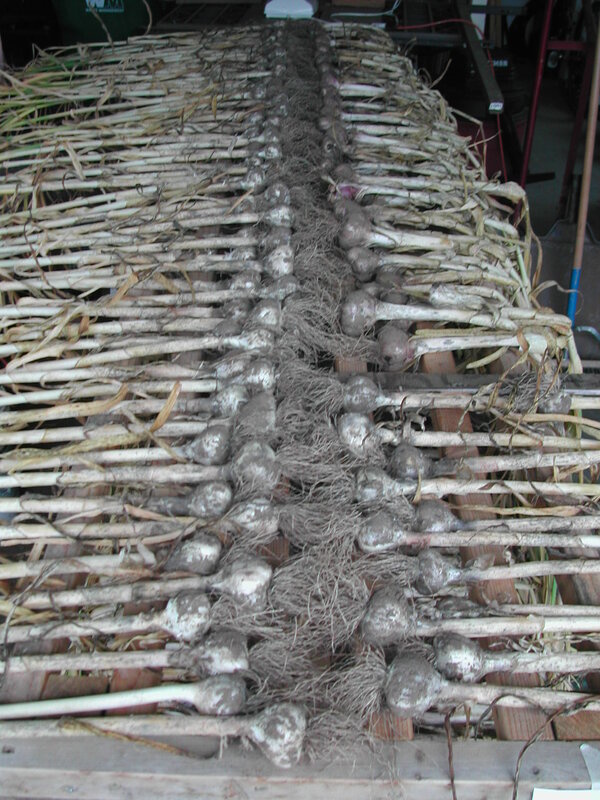 What all this means is that the garlic will not have as many layers of wrapper leaves (the papery covering) around the heads. It may end up looking a little dirtier on the outside, since I don’t have as many layers I can peel away. Not the worst problem I can think of. I often think about taking a side-by-side taste test with the different varieties of fruits and vegetables I grow. I think about it a lot with things like garlic, tomatoes and apples. Somehow, I never get around to doing it. I think this year will be the time for garlic (hopefully tomatoes, too). I’ll take four small heads, roast them and see what differences I can taste. I have heard it said that the hardneck varieties have better flavor, while the softneck varieties store longer. Maybe this year, I will find out if that is true. Note: If you’d like to try a taste test yourself, let me know in your order. I’ll label each variety for you. ← The Tomatoes Are Coming! 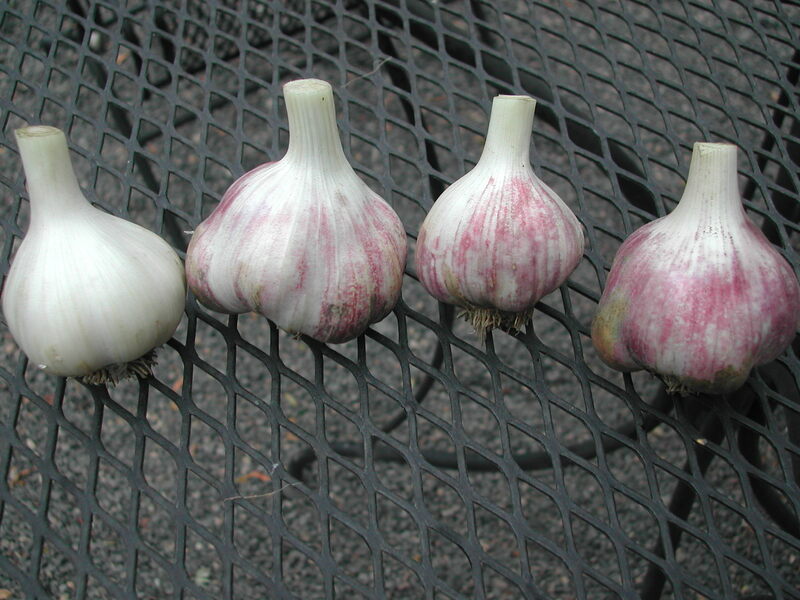 love reading about your garlic growing and glad the Uprising seed stock was so good. we are growing a lot out, too and had similar experience of scapes, rain… x 3…… as long as the garlic is solid, i think it’s still beautiful even in years like this one with less wrapper. your garlic is beautiful! !